The London metropolitan police started its 101st murder investigation over the weekend in a sad numeral reminder of what is, according to Mayor Sadiq Khan, probably ‘part and parcel’ of living in the UK capital. As violent crime continues to soar in London, current figures are on track to make 2018 the deadliest year of the past decade. Related coverage: <a href="https://thegoldwater.com/news/34159-UK-Children-Disembowelled-In-Another-London-Mass-Stabbing-Brawl-Of-30-Youths-Video#34185"> UK – Children ‘Disembowelled’ In Another London Mass Stabbing Brawl Of 30 Youths (Video)</a>. More voices in the British parliament are starting to point towards the London mayor, as Mr Neil O'Brien, a Conservative MP, declared that: "Sadiq Khan needs to get a grip on this horrendous epidemic. London has the resources it needs, but needs political leadership, which is currently lacking." Londoners will be reminded of the lawlessness in the capital when those attending the famous Notting Hill Carnival during the long holiday weekend are obliged, for the first time in history, to pass through knife arches. Mr Khan didn’t focus on the number, instead highlighting a Metropolitan Police press release which laid out the security plans for the carnival which he stated was a "fantastic celebration of what makes London great" whilst thanking officers for "making sure it’s safe for everyone to enjoy themselves". 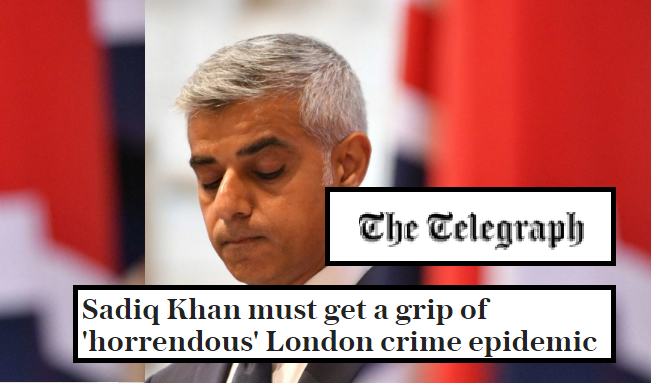 Related coverage: <a href="https://thegoldwater.com/news/34776-UK-Islamic-Drug-Gang-Sentenced-in-Khan-s-London-Media-Silent"> UK - Islamic Drug Gang Sentenced in Khan’s London, Media Silent</a>. Former Home Secretary Lord Blunkett reacted to the 100 mark being passed, stating: "It's a tragedy that we have reached this unacceptable benchmark. When will they get it through their thick heads that he endorses it?